Although clerics are not a particularly popular class, if played the right way they can offer a lot of the benefits of magic and fighting. The cleric is basically a divine spellcaster, but he has the ability to wear any armour type, the ability to melee (such as ‘cleave’) and most importantly he can cure his or his companion’s wounds. This class offers some similarities to the Monk class in terms of dedication to the will of his God, be it Majere or the evil Shar, and therefore makes the Wisdom attribute equally as important in creating and developing your character. The initial die-throws for Hit Points are good for hand-to-hand combat, however he isn’t a fighter. Some strength is important but is generally not essential, unless choosing a domain centred upon physical strength. We’ll talk about domains later. So, in playing a Cleric the two main abilities which you need to look after are Wisdom and Charisma. In Role play, alignment is important when creating a cleric. In choosing what deity to serve, you will have to remain one-step away (in the axis) from his/her alignment. In the case of an alignment shift, you will have to change your deity accordingly. The possibility of choosing domains according to deity is available in some multi-player servers, and can be implemented using the NWN toolset. However, we won’t worry about that here as it would be too complex and lengthy to discuss it. N.B. 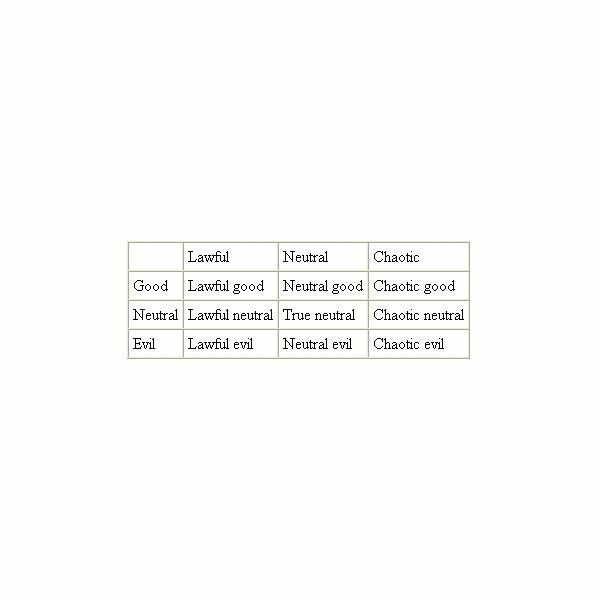 Alignment is much more complex in D&D rules, all you need to worry about are things like killing an innocent shopkeeper (in the case of a LG alignment) or rescuing someone (in the case of a CE alignment). Bane (Lawful Evil) – Also known as The Black Lord, he is the God of Strife hatred and tyranny. His symbols are an upright black hand on a red field and he requires a Strength ability of 12 and a Wisdom ability of 10. Clerics of Bane are in command of mind affecting spells (such as fear) and are therefore immune to them. They favour bludgeon weapons such as the hammer, mace or club. Tyr (Lawful Good) – The greater power of the seven heavens, he rules justice duty and loyalty for his servants. Emphasis on loyalty requires high Charisma scores so that you are able to influence your companions and those around you. Tyr requires a Wisdom of 15 and a constitution of 12. Weapons are same as any cleric, or bludgeon type weapons. Malar (Chaotic Evil) – The Beastlord, the deity of bloodlust and evil creatures such as werewolves. Clerics of Malar are dressed in hunting attire, such as leather or hides displaying red or brown colours. High Clerics can gain access to the ‘Claws of Malar’, a weapon worn at the knuckles with spiked edges, inflicting great piercing damage. Races suited to the cleric are the human race or the half-elven class. Choosing a race isn’t particularly important when playing this class of character, since almost any race can play the cleric, but as with the previous guide we’ll look at how to maximize modifiers and extra points for your character. Unfortunately, no race offers a positive Wisdom modifier. A human cleric has no positive or negative modifiers, but offers you the chance to gain an extra ability point per level, and an extra feat. The extra feat is quite useful since the cleric only has access to standard feats. A Half-Elven cleric offers a +1 modifier to Search, Spot, and Listen checks. It also offers a +2 to saving throws which greatly enhances spell resistance; useful for a cleric since willpower and belief is everything. This domain tunes the cleric to his natural surroundings and, much like a Ranger or Druid, he is able to call upon a faithful animal servant to aid in combat. As the name implies, you are able to summon an shadow ally, much like a phantasm, and gain necromancy related spells. Gain spells similar to the arcane school of necromancy, they can destroy their enemies or weaken them with their faith and will. Domain Abilities and Spells: Smite Infidel: Banish a creature of an opposing alignment, once a day. Spells: Rage at level 3, Acid fog at level 6. This domain allows you to increase your resistance to physical attacks. Domain Abilities and Spells: Toughness: Gain an additional hit point per level. Spell: stoneskin at level 4, energy immunity at level 5. Manipulate negative energies and gain control of the supernatural evil creature who infest the realms. Domain Abilities and Spells: Turn Outsider: Similar to turn undead but used against demons such as Balors or other similar creatures. There are so many domains to list that this article wouldn’t do them justice. Please visit https://www.thieves-guild.net/index.php?pid=139 for a truly comprehensive guide on Clerical Domains. That is more or less all you need to play your chosen Cleric.